Samuel de Champlain spent much time writing descriptions of the territory and peoples he encountered in the place that is now North America. He was also a maker of maps. His maps and writings provide us with an understanding of where he travelled and how he interpreted the places he visited and people he met. 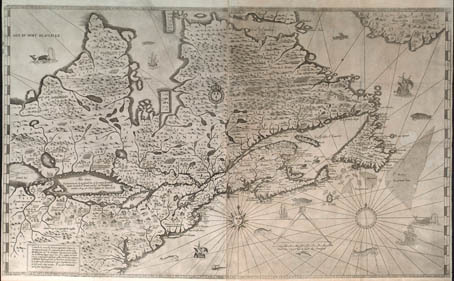 “Although today Champlain is best known to the general public for having placed on a permanent footing the French presence in North America, individuals interested in the history of cartography and of exploration hold him in high regard for the exceptional quality of his maps and plans.” – Conrad E. Heidenreich and Edward H. Dahl, “Samuel de Champlain’s Cartography, 1603-32,” 2004. Modern cartographers have drawn upon Champlain’s maps and descriptions to produce their own representations of his travels and explorations in North America. Their maps help place Champlain’s journeys in the context of a more current understanding of the geography of North America. The maps shown here provide a more recent interpretation of Champlain’s journeys and the territories and trade routes of the aboriginal nations he encountered. As our understanding of Champlain’s journeys in North America and his relationship with its Aboriginal Peoples continues to evolve, so do the writings and maps produced about him and his travels. These written and cartographic contributions to the story of Champlain are in many ways products of the time and place in which they were produced. Changes in technology also lead to new possibilities for cartographic interpretations of his travels, explorations and interactions. A recent mapping project undertaken by cartographers at the Canadian-American Center, University of Maine, resulted in a new explanatory map that illustrates the travels and explorations of Samuel de Champlain in Canada between 1603 and 1616. Through its creative inclusion of stories, emotions and Aboriginal voices and place names, this map broadens our understanding of Champlain’s journeys in North America and opens up new possibilities for cartographic interpretation of this aspect of Canadian history.